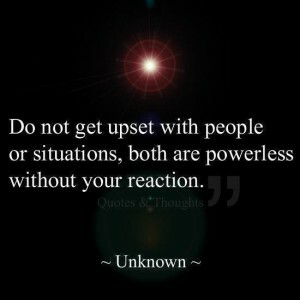 HJ: Just because someone pushes your buttons, doesn’t mean you have to react. In fact, you can quite easily develop the ability to stay centered no matter what life throws at you. Before we reveal how you can become reaction-less (if you choose), you need to understand why you react in the first place. Your brain is naturally reactive, so when, for example, you see a flower, your subconscious mind calls up all the emotions and thoughts it has associated with flowers. In this example, unless you are allergic, it is probably all positive. You will recall the pleasure of seeing and feeling a flower, perhaps its fragrance and maybe getting a surprise bouquet from a lover… It will produce a naturally positive emotional reaction. However, your brain reacts the same way to any stimuli, so when someone yells at you or is late to a meeting or doesn’t do what they said they would, your brain recalls all the other times that has happened to you with other people and the emotional responses and memories associated with those events and circumstances. Furthermore, most people do not release emotions as they happen, but try to escape them or repress them, which means that when they are triggered by situations far removed in time (perhaps even decades later!) from the original moment when we first experienced and developed the emotional charge, we still react in the same way we did that first time we felt the pain, anger, fear or frustration involved with that scenario. Even though the event we are experiencing right now that is pushing our buttons may be minor and inconsequential, we still react habitually and disproportionately to whatever stimulates our memories, both emotional and otherwise, as we are just replaying the buried emotions and memories that have been stored in our subconscious mind. This means we react to situations disproportionately and habitually in ways that absolutely do not serve our highest good. Therefore, in order to stop reacting to people and situations that push your buttons, you need to release the emotional charges associated with the memories you have of the situation in the past. This makes you ‘clear’ and allows you to stay centered, no matter what as the emotional charges have been removed. The wonderful article below by Margie Warrell outlines a simple, but highly effective process to accomplish this. She specifically focuses on anger and frustration, but the process can be used for ANY emotional state or habitual pattern that you want to release permanently. I recently read that 60% of Americans lose their temper at least once per week. I’d like to tell you I wasn’t in that number but alas, my kids would tell you otherwise.Of course losing our temper is what happens when we fail to keep our anger in check. Something (or someone) pushes our buttons and, unable to contain our anger, we explode. The result is never pretty. Last week I was asked to talk about anger on Better TV. Despite my occasional outbursts at my kids I wouldn’t say I am a particularly angry person. Which got me thinking, why are some people constantly angry while others seem perpetually serene and calm? And for the majority of us who fall somewhere in the middle, how can we process the emotion of anger in more constructive ways? First let me repeat what I wrote in my book Find Your Courage. Anger, on its own, is neither good nor bad. Rather it’s a natural emotion that arises when we perceive an injustice to ourselves or others. The problem does not arise when we have anger. It arises when anger has us. It’s how we respond to it that determines whether it is helpful to our relationships (by addressing valid issues that threaten to undermine them) and good for society (by working to end injustice) – or damaging to our relationships, destructive to our circumstances and plain old bad for our health (think heart disease, depression, ulcers… I’d go on but it doesn’t get better!). In other words, our response to anger ultimately creates more suffering for us and others, or less. It all hinges on how we process and express it. Learning to manage anger isn’t easy. It takes a heightened level of self-awareness, a good dose of discipline and a robust commitment to honoring the dignity of others and our own. Below are a few strategies that will help you the next time you find yourself feeling as mad as a hatter. Label it. If you don’t own your anger, it will own you. Naming the emotion you feel enables you to process it. So if you can, step back and try to observe what’s going on — around you and within you. Verbalizing aloud, “I am feeling angry” helps you detach from it. Anger isn’t you. It’s just the emotion that has risen up in you. Identify the fear fueling it. Underneath our anger is fear… fear of loss of property, relationship, security, reputation or control; fear of us or someone we love being hurt; fear that the crazy driver who just cut in front of you may damage your car. Clarifying why you feel angry helps you respond to it constructively. Give yourself time out. The stress hormones anger triggers literally impair the oxygen flow to the brain. So it takes time for those hormones to level out and rational thinking to return. As cliché as it sounds, counting slowly to 10 before reacting can help defuse your temper. 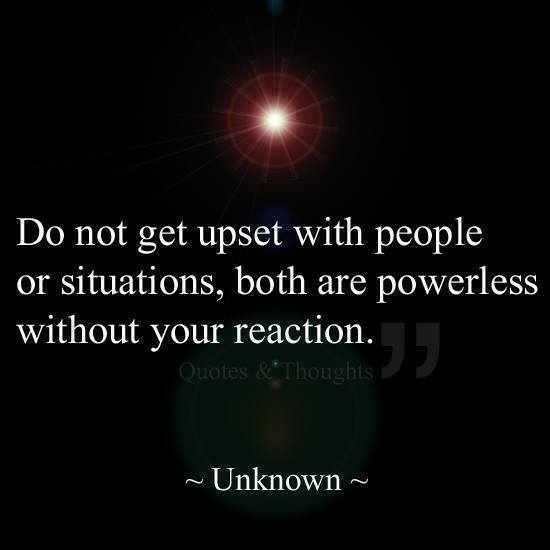 Better still, take a break from the person you’re angry with until your frustrations subside a bit. Go for a walk, run or bike ride, listen to music, take a bath, do some gardening, etc. I’ve found jumping on the trampoline with my kids highly therapeutic! Consciously choose your response. Being able to consciously choose how you will respond is what anger management is all about. What is the most constructive response to this predicament? What is the outcome you most want to achieve that is good for you and others? What conversation do you need to have, with whom and about what? What changes need to happen? Don’t bottle it up. While some people are quick to fire off in anger (damaging trust in their relationships in the process) others tend to bottle it up and stew on it. But issues that aren’t talked out get acted out. Denying or repressing anger is no better than lashing out with it. Resentments left to fester slowly build up… and up… and up… driving a wedge in your relationships and impeding your productivity until it gets very ugly. Create daily rituals for staying centered. Managing anger begins with self-awareness. Mindfulness is something you do, not something you have. Regularly taking time to reflect on how you are feeling, identify the concerns that underlie it, become present to the impact your behavior is having on others, and re-center yourself emotionally are habits you can begin to develop right now. We human beings are emotional beings. Forever evolving, forever wrestling with those uncomfortable emotions like anger, forever on a quest to rise above them and be firmly in control. The reality is that living life to the fullest requires us to experience the full spectrum of emotions. They all serve a purpose and yet they can all hijack our happiness if we aren’t honest enough with ourselves to own the primal fears that drive them…. of looking foolish, of injustice to ourselves or others, of being inadequate and insignificant, of being unlovable or rejected, of being vulnerable and hurt, of losing those we love, of losing control, of being mortal.In the end, there is no magic bullet to remaining forever calm, contained and cool when something or someone has really pushed your buttons and frustration, resentment, anger and outright fury begin to well up in you. Learning to regulate our emotions is a lifelong pursuit. Sometimes two steps forward, one step back. So just as I will work to forgive myself for not always being a patient and calm mum, I encourage you to forgive yourself for the many times you have failed to control your temper. Forgive yourself for not managing your anger, rising above your fear, overcoming your insecurities and responding calmly and bravely to your challenges. And while you are at it, forgive those around you who’ve done the same. After all, the greatest remedy for everything that weighs your heart is forgiveness. Margie Warrell is an internationally Certified Professional & Life Coach, acclaimed Speaker and Best Selling Author who helps people Think Bigger & Live Bolder to achieve outstanding success in all areas of their life. To learn more about her award winning book Find Your Courage (McGraw-Hill), a range of powerful programs, and to receive her free monthly eNewsletter please visit Margie Warrell.com.